...... Programmers can write their own modules / plugins and thereby add new functionality allowing users to create new kinds of specialized tasks and batches. Automation modules include: FTP uploader, web page optimizer, text replacer, image effects (batch resize images, create disabled glyphs etc. ), list directories in HTML and text, run other applications, path name fixer and more. Use the built-in conversion, batch and automation tools to save time. Speed up and automate repetitive computer tasks such as file handling. Visually add file and directory patterns you want to be batch processed. 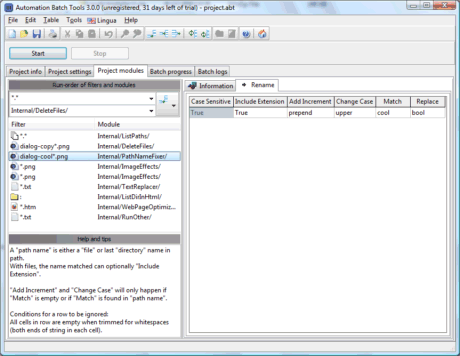 For each job in list select and configure an appropriate automation module. Develop or download more integrated automation software modules and plugins. Qweas is providing links to Automation Batch Tools 3.1.7 as a courtesy, and makes no representations regarding Automation Batch Tools or any other applications or any information related thereto. Any questions, complaints or claims regarding this application Automation Batch Tools 3.1.7 must be directed to the appropriate software vendor. You may click the publisher link of Automation Batch Tools on the top of this page to get more details about the vendor.